The Japanese have broken the 10 petaflop barrier. On Wednesday, Japanese IT giant Fujitsu and the government-funded RIKEN research lab announced that the supercomputer they’ve built in Kobe can speed through 10.51 quadrillion floating point operations per second. Known as the “K Computer,” this is the first megamachine to achieve 10 quadrillion operations a second — aka 10 petaflops — and it will be named the world’s fastest supercomputer when the official Top 500 list is unveiled next week. Earlier this week, the Chinese made headlines when they uncloaked a world-class supercomputer built entirely with homegrown processors, but this “Sunway” cluster is unlikely to crack the global top ten. The K Computer is ten times faster — when it revs up to peak performance. When the last Top 500 list was announced this past June, the K Computer took home the ultimate prize, and earlier this week, Jack Dongarra — the University of Tennessee professor who oversees the list — told us the Japanese machine will retain its crown when he releases the latest list at the SC11 trade show in Seattle on Nov. 14. The K Computer was commissioned by the Japanese Ministry of Education, Culture, Sports, Science, and Technology, with the aim of breaking the 10 petaflop barrier. The K is named for the Japanese word “kei”, which represents 10 quadrillion. The original idea was for indigenous IT giants Fujitsu, Hitachi, and NEC to collaborate on the $1.2bn project, but in the wake of the 2009 worldwide financial crisis, both NEC and Hitachi dropped out of this all-Japanese effort. This left Fujitsu to build the cluster using its own SPARC64 VIIIfx processors — chips specifically designed for this sort of “high performance computing” (HPC). The K Computer spans 864 server racks and over 88,000 interconnected CPUs, all able to work towards a common task. 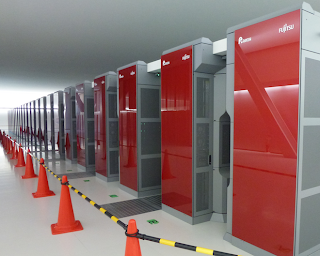 The last of the racks were installed at the RIKEN lab in Kobe, Japan this past August, and now, Fujitsu has released the official benchmarks — a hallowed moment in the world of supercomputing. According to the industry standard Linpack benchmark, the K Computer’s average performance is about 93 percent of its peak 10 petaflop speed. In June, it topped the Top 500 list with a peak performance of 8.162 petaflops. But it won’t keep its crown for long. The kings of the supercomputing game never do. IBM and Cray are building 20 petaflop machines for the Department of Energy, and these should go live next year. This morning, during a panel discussion at the Four Seasons Hotel in San Francisco, several HPC gurus discussed the next major milestone: the exascale supercomputer, a machine that’s one hundred times faster than the K. But this is likely several years away. Theoretically, we could build an exascale supercomputer today, but it wouldn’t be financially viable — mainly because it would use far too much power. The aim, said Chuck Moore, a corporate fellow and technology group CTO at chip-designer Advanced Micro Devices, is to achieve exascale performance at 20 megawatts of power. Each megawatt, he said, translates to about a million dollars a year in electricity costs alone. Fujitsu was not able to give us the official power consumption of the completed K cluster, but in June, when it reached a one petaflop peak, it consumed 9.89 megawatts — aka $9.89 million dollars a year.